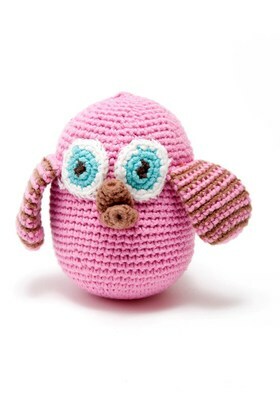 Pebble fair trade, hand made, pink cotton crochet owl rattle. These cute little owls have huge eyes, cute little beaks and super little wings without any stuffing that are idea for little fingers to grab. A really fun baby rattle that will still be a favourite long after they've grown out of all the other rattle toys. These owls measure approx 9cm high x 9cm wide. Suitable from birth. All Pebble toys are made in Bangladesh by the extrememly talented and capable artisans at Hathay Bunano ps. Pebble toys help support families in rural Bangladesh, removing the need for economic migration to the cities and providing women with flexible working opportunities which are close to their homes. They are machine washable at 40degrees and can be tumble dried on a low setting.